PPP is a data link layer protocol mainly intended to establish point to point connection over the serial link like the console port we have on our Switchfin targets. Let's see how we can demonstrate this. In the latest Switchfin we have PPP option in the menuconfig. Please enable it and build the image. Connect the serial port of a PC with PPP support with the PR1 Appliance console port. Establish the ssh sessian with the PR1 Appliance. Similarly you may ssh the PR1 Appliance thru the new ppp0 interface. PPP can work not only over serial link. Let's see how it can be used to create VPN over the Ethernet. In addition we will test the MPPE (Microsoft Point-to-Point Encryption/Compression) support built in as kernel module. Let's use one of the Linux PC in the network as PPPoE server. PPPoE is a simple protocol and basically it is pretty much like the DHCP negotiation. CHAP is an authentication schema. To prevent exchanging the username/password (as it is in the other popular authentication PAP) this method sends random number (challenge) which is processed by both PPP ends using hash function. The results of the hash is compared. Now let's go to the PR1 Appliance side. We use the same image with the built PPP option. PPPoE we will start using pppd plugin rp-pppoe.so. We will use eth0 as carrier interface. A new hardware target has been added in Switchfin. 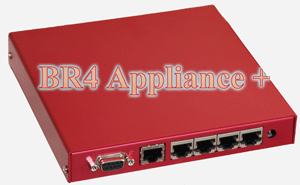 It is four ports BRI Appliance. It goes in an aluminum enclosure more stable hardware and software design bigger memory capacity and supports TE/NT software selection out of the box. Cost-effective ISDN BRI solution for SOHO & SMB market. 1GB flash for voicemail and prompts. Optional, hardware based echo cancellation (LEC-64-BRI). Codecs: a-law, u-law, Speex, GSM. The hardware can be purchased from Switchvoice Ltd.
Switchfin was updated to uClinux 2010R1-RC5 (based on Linux kernel 2.6.34.7) for all supported hardware targets. All the targets have passed our main test suite. Volunteers to do further testing of the update are very very welcome. 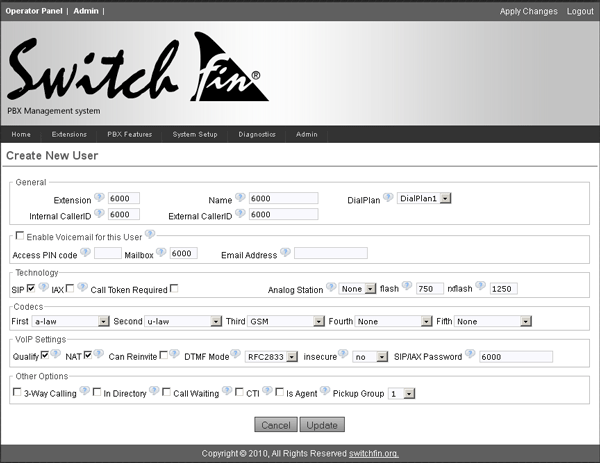 Due to the hard work of our main WEB developer Jason Kenah we have fully working multilingual support in the Switchfin GUI now. Apart of the default English language now we can select also French. The selection is done in the System Setup -> Options -> Language Settings. In the same menu you can also download the corresponding sounds prompts if you would like to. Adding new languages now means just translation of the string array in a single place and should be pretty easy job. 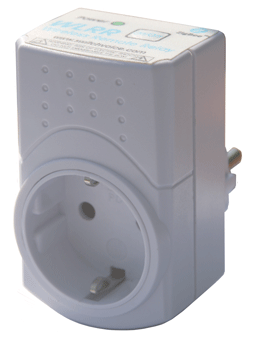 In case your IP02 or IP08 is equipped with GSM1 module you can send and receive SMS. Now you can do it directly from the GUI. Our WEB developer Jason has implemented an intuitive SMS Manager.